including breathtaking forests, world-famous waterfalls, awesome savanna and high-altitude grasslands. Only recently has this amazing country got to grips with issues of tourism development and infrastructure but it is now a fully-operational and rapidly-growing destination. The “jewel in the crown” must certainly be Bwindi Impenetrable Forest National Park which is one of the best places in the World to see GORILLAS, and this will be high on our list of targets on this spectacular trip. Of course there will be many other things to look for including African Green Broadbill and a bunch of Albertine Rift Endemics. In Kibale we will look for Chimpanzees and the rare Green-breasted Pitta as well as a host of other superb species. And don't forget the amazing Shoebill which is another must-see bird that we will have a great opportunity to find. Our very special short trip will give you a once-in-a-lifetime opportunity to see some of the world's most sought-after birds and mammals. Included in cost: Full-board accommodation in twin or double en-suite rooms (according to availability), all meals from dinner on 9th July to lunch on 18th July, drinking water from van cool box, transport in exclusive 4x4 Land Cruisers which accommodate 6 guests, all boat excursions mentioned herein, all park and reserve entry fees, and services of all local driver-guides and leaders. 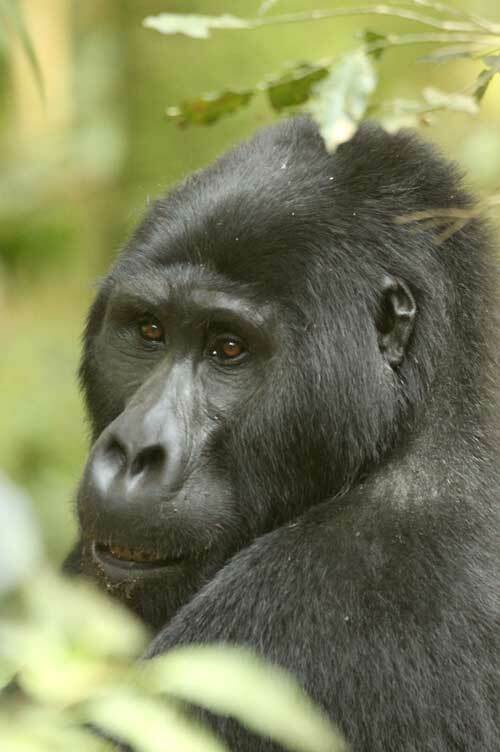 • Gorilla permit (subject to availability), which is USD 600 per person. • Chimpanzee permit (subject to availability), which is USD 150 per person. Early booking recommended! You will need us to book you a permit if you intend looking for Gorillas or Chimpanzees. PLEASE LET US KNOWN STRAIGHT AWAY IF YOU WANT TO DO EITHER OF THESE TWO TREKS. Accommodation: Ranges from standard to good, food is generally of a high standard and mostly buffet-style. Tour Code: On this tour we will be looking for a variety of bird species that include many Albertine Rift Endemics as well as some very sought-after mammals such as Mountain Gorilla and Chimpanzees. The days can be long as it is important to be out at dawn and again out until dusk, as this is when most species are at their most active. but we shall endeavor to rest in the middle of the day or use this time to travel to our next destination. Each vehicle will hold up to 6 passengers, driver and a guide. The walking in most areas will be on well-defined mostly level tracks but at Ruhija the trek for Mountain Gorillas can take us away from forest trails and into areas that may be steep, slippery or thickly vegetated. Good walking boots and rain gear are essential in case of the off-chance of unseasonal showers.